Assuming that brakes are fitted throughout the length of the train, there are two main types of actuating systems commonly used:- vacuum brakes and air brakes. This article describes the 'simple' vacuum brake system. 'Simple' in this context means the brakes are applied when vacuum is present in the brake line. i.e. vacuum present equals brakes on. What is a vacuum? A vacuum is defined as:- "A pressure less than atmospheric pressure", and reflects how thoroughly air is removed from within a space, the so-termed 'the higher the vacuum', the less air left in the space. Air pressure at sea level is defined as 1 atmosphere (=1 atm =1.01 bar =101 kPa =14.7 lb/sq.inch =29.9 inches of Hg [mercury]), and this the maximum vacuum which can ever be achieved when the air is entirely removed. In practice this value is difficult to achieve and can rarely be reached, but a vacuum of 80~90 kPa below atmospheric can be regarded as a maximum working value possible with simple equipment. Because of this pressure limitation, vacuum actuating cylinders tend to be larger in diameter than pressure operated versions of equivalent power. This larger diameter sometimes makes it difficult to incorporate into a model. An electric pump on battery powered models, or with a separate battery. Vacuum generated by mechanical methods usually needs to be 'stored' in an on-board tank or reservoir. (How do you store an absence of air? it is a bit of a misnomer but you get the idea). This is because the pumps are relatively low capacity, and top-up the reservoir after a brake application. Steam ejectors are, relatively, larger capacity and operate on demand, so storage is not required. It is usual practice to install near the driver a vacuum gauge on the brake line to see how much braking effort is being applied. A gauge is also installed on the reservoir if used. Inter-car connectors. A short piece of straight pipe 1/4" (6.35mm) dia is all that is required, and a piece of rubber or plastic hose simply pushed on is all that is required. The vacuum inside the train pipe holds the connection hose in place. See photo below for a typical installation. On the car ends, and always on the last car, the brake line must be sealed. 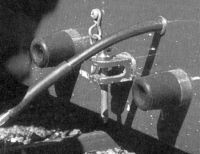 A short stub pipe closed at one end is pushed onto the train line connection to plug the line, or a blind spigot, the same diameter as the train pipe, is mounted on the car end and the inter-car pipe simply bent around and pushed onto this spigot. What size vacuum acuators? A typical implementation of an actuator (brake cylinder) is shown below. The diaphram is made from 1.5mm (1/16") rubber sheet. There are some losses due to the rubber diaphram flexing, but these are usually small (approx 10~15%). A diaphragm of 70mm (23/4") dia will produce an operating force of around 33 kg (~75 lbs), and is normally adequate. An air bleed hole must be drilled in the casing on the atmoshere side of the diaphram to permit free movement of the diaphram/piston assembly. 97 Text and photos Copyright © 2006-2019 SMEX, All rights reserved.